Our specialists react to each and every challenge with integral, individual consultancy. Applying team spirit and a great deal of commitment, we quickly put ourselves in the place of our customers. The fields of shop construction, textiles, porcelain, consumer electronics or mechanical engineering – we are at home in your world. We always strive for the best functional and economic solution. Innovative software support ensures efficiency, punctuality and consistent top quality. Flexibility and capability make us into a competitive partner for high-quality products and economic mass production, even in the face of international competitors. We will gladly advise you in matters pertaining to design and manufacturing – such as in the selection of suitable materials and economic manufacturing methods for your individual requirements. If you so require, we can assume the complete planning of your specific solution. Since we are at home in the various lines of business, we can easily put ourselves in the world of our customers. You can rely on Kollinger right from the start since we use 2-D and 3-D CAD for the manufacture of your products. Using precise 3-D volume models / prototypes, we examine the form and the function of a design in advance under practically realistic operating conditions. This saves you development costs and means that your product is on the market that bit quicker. Our software: AutoCAD and Autodesk Inventor. The optimum implementation of the ideas of our customers starts with our internal prototyping and toolmaking. 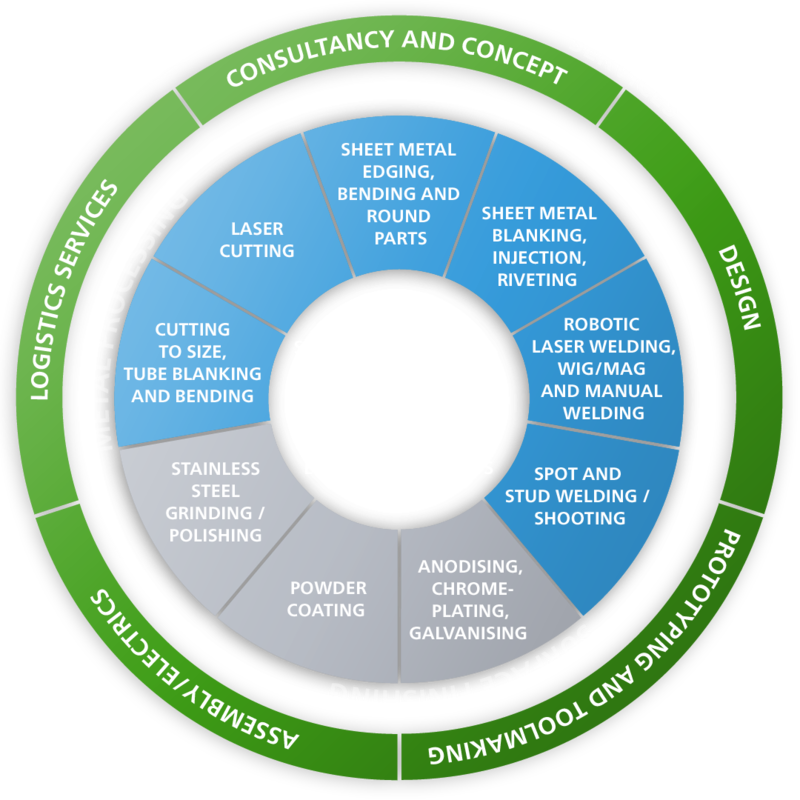 In addition to tools for blanking, edging or bending, we design special machinery and complicated welding devices for our robotic welding systems – through to readiness for series-production. In the Kollinger prototyping department, we quickly and flexibly manufacture samples and fully process small orders. This also includes lathe work and milling. Exceptional high parts production with first-class cutting quality: Our two new BySprint Fiber 3015 / 4kW systems from Bystronic with fully automatic ByTrans unit for unmanned production quickly and economically process sheet metal in the size of 3000 x 1500 mm. The SOYER coordinate table KTS-2550 with CNC control – for precise, fully-automatic welding-on of bolts and pins – extremely fast and reliable. Kollinger works with six grinders in its grinding shop. In addition to a great deal of feeling and experience, we use vibratory grinding equipment by Rösler and a Kuhlmayer surface grinder. We also perform high-gloss polishing works, grind and brush stainless steel parts in-house. We commission reliable specialist companies from close-by with glass bead blasting works. Following degreasing in the four-zone washer, we coat your parts in any number of various options. All powder qualities are possible, as are all RAL and special colours as well as various surface effects and structures. Our automatic booth with powder recovery saves costs - and the environment. Regional partners of many years’ standing perform these works for us reliably, quickly and cost-efficiently. According to the requirements and customer wishes, we can assume the assembly of individual components or finished products. Along with the metal components produced in-house, we also process wooden, glass and acrylic elements as well as electrical parts. Kollinger’s electricians guarantee safety and quality in the assembly of all electrical parts – irrespective of whether they are parts from our product portfolio or provided by you. All electrical products supplied by us comply with the VDE 0702 / DGUV3 electrical test. As a provider of logistics services Kollinger assumes picking, storage and dispatch tasks. Our high-bay warehouse with over 2,000 storage positions affords you a great deal of freedom. Our fast-reaction merchandise information system monitors your stock 24-7.